A natural gas vehicle (NGV) is an alternative fuel vehicle that uses compressed natural gas (CNG) or liquefied natural gas (LNG) as a cleaner alternative to other fossil fuels. Natural gas vehicles should not be confused with vehicles powered by propane (LPG), which is a fuel with a fundamentally different composition. Worldwide, there were 14.8 million natural gas vehicles by 2011, led by Iran with 2.86 million, Pakistan (2.85 million), Argentina (2.07 million), Brazil (1.70 million), and India (1.10 million). The Asia-Pacific region leads the world with 6.8 million NGVs, followed by Latin America with 4.2 million vehicles. In the Latin American region almost 90% of NGVs have bi-fuel engines, allowing these vehicles to run on either gasoline or CNG. In Pakistan, almost every vehicle converted to (or manufactured for) alternative fuel use typically retains the capability to run on ordinary gasoline. As of 2009, the U.S. had a fleet of 114,270 compressed natural gas (CNG) vehicles, mostly buses; 147,030 vehicles running on liquefied petroleum gas (LPG); and 3,176 vehicles liquefied natural gas (LNG). 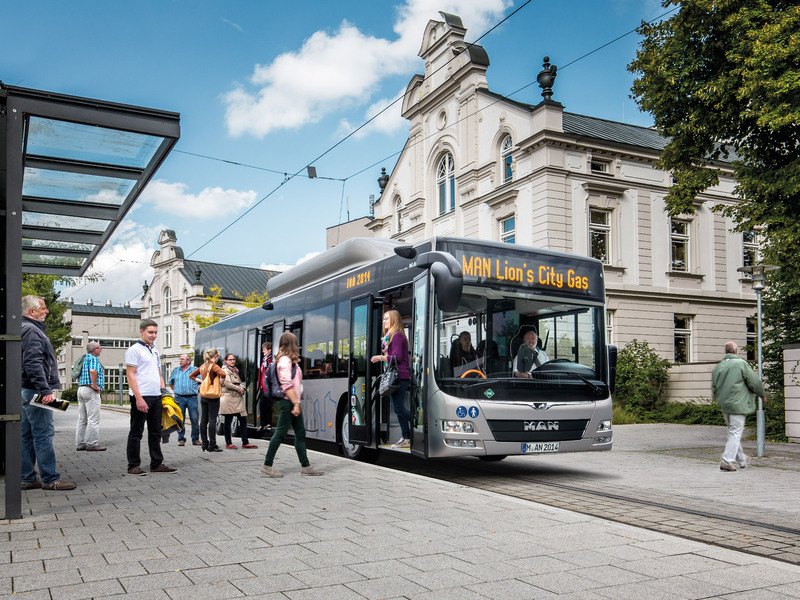 Other countries where natural gas-powered buses are popular include India, Australia, Argentina, and Germany. In OECD countries there are around 500,000 CNG vehicles. Pakistan’s market share of NGVs was 61.1% in 2010, follow by Armenia with 32%, and Bolivia with 20%. The number of NGV refueling stations has also increased, to 18,202 worldwide as of 2010, up 10.2% from the previous year. Existing gasoline-powered vehicles may be converted to run on CNG or LNG, and can be dedicated (running only on natural gas) or bi-fuel (running on either gasoline or natural gas). Diesel engines for heavy trucks and busses can also be converted and can be dedicated with the addition of new heads containing spark ignition systems, or can be run on a blend of diesel and natural gas, with the primary fuel being natural gas and a small amount of diesel fuel being used as an ignition source. An increasing number of vehicles worldwide are being manufactured to run on CNG. Until recently, the Honda Civic GX was the only NGV commercially available in the US market. However now Ford, GM and Ram have bi-fuel offerings in their vehicle lineup. Fords approach is to offer a bi-fuel prep kit as a factory option, and then have the customer choose an authorized partner to install the natural gas equipment. Choosing GM’s bi-fuel option sends the HD pickups with the 6.0L gasoline engine to IMPCO in Indiana to upfit the vehicle to run on CNG. Ram currently is the only pickup truck manufacturer with a truly CNG factory-installed bi-fuel system available in the U.S. market. citation needed] Outside the U.S. GM do Brasil introduced the MultiPower engine in August 2004 which was capable of using CNG, alcohol and gasoline (E20-E25 blend) as fuel, and it was used in the Chevrolet Astra 2.0 model 2005, aimed at the taxi market. In 2006 the Brazilian subsidiary of FIAT introduced the Fiat Siena Tetra fuel, a four-fuel car developed under Magneti Marelli of Fiat Brazil. This automobile can run on natural gas (CNG); 100% ethanol (E100); E20 to E25 gasoline blend, Brazil’s mandatory gasoline; and pure gasoline, though no longer available in Brazil it is used in neighboring countries. NGV filling stations can be located anywhere that natural gas lines exist. Compressors (CNG) or liquifaction plants (LNG) are usually built on large scale but with CNG small home refueling stations are possible. A company called FuelMaker pioneered such a system called Phill Home Refueling Appliance (known as “Phill”), which they developed in partnership with Honda for the American GX model. Phill is now manufactured and sold by BRC FuelMaker, a division of Fuel Systems Solutions, Inc.
CNG may also be mixed with biogas, produced from landfills or wastewater, which doesn’t increase the concentration of carbon in the atmosphere. Despite its advantages, the use of natural gas vehicles faces several limitations, including fuel storage and infrastructure available for delivery and distribution at fueling stations. CNG must be stored in high pressure cylinders (3000psi to 3600psi operation pressure), and LNG must be stored in cryogenic cylinders (-260F to -200F). These cylinders take up more space than gasoline or diesel tanks that can be molded in intricate shapes to store more fuel and use less on-vehicle space. CNG tanks are usually located in the vehicle’s trunk or pickup bed, reducing the space available for other cargo. This problem can be solved by installing the tanks under the body of the vehicle, or on the roof (typical for busses), leaving cargo areas free. As with other alternative fuels, other barriers for widespread use of NGVs are natural gas distribution to and at fueling stations as well as the low number of CNG and LNG stations.